Discover Cuenca Ecuador and BEYOND! : How Can Only One Post Office Serve the Whole City of Cuenca Ecuador? How Can Only One Post Office Serve the Whole City of Cuenca Ecuador? Reader Asks: How Can One Post Office Serve Such a Large City? Frank and Angie Respond: How can one post office serve a city of a half a million people? That’s a good question. When we first moved to Cuenca in 2011 we were able to rent a post office box ($24 per year) without any problems; and by 2012 and 2013 after lots of new arrivals began coming to Cuenca, all the PO boxes were being rented and none were available. This left new arrivals without a PO Box to hold their incoming mail. However, if they registered their name and phone number with the post office they could still receive mail. The post office staff would simply hang on to it (somewhere…who knows where) and then call and let them know they had mail. That can be a bit risky if many people are without a mail box and lots of mail just lying around all over the place. Around that time (2012 and 2013) we would often see ads in the gringo portals by expats that were moving back to North America and they wanted to sell their PO Box to gringos who were waiting in line for a mailing box. And sometimes they would give them away. You would then have to go to the PO Box and reassign your name to the box. Today, four and a half years later that problem has pretty much been handled. The Post Office got in 200 new mailing boxes; we know what you’re thinking. 200 new boxes does not seem like much but when the expats come and go like they do, it could be enough? Mail Drops in Cuenca? What’s That? As far as having only one post office to service the city of Cuenca, the problem is not so much lack of more post offices but the lack of available places to drop off your mail and small packages in the city. In the U.S, as we know, they have the blue drop boxes strategically placed around the city, usually by the grocery stores and strip malls, but here, they only have a few mail drops in the city, and this is a new service. We know of one place where you can drop off your mail and that is inside San Sebas Restaurant in the San Sebastian Square in El Centro…but by then you may as well just go to the post office in El Centro and drop off your mail there. It is not obvious and apparent that there are drop off points for your small mail around the city. If there are, and readers have used them successfully, please be kind and list them at the bottom of this article for other readers. Thank you. Waiting times and lines can be long at the post office, especially during peak hours and on Mondays and Fridays. Always expect there will be at least two or three people in front of you and wait times can be at least 15 to 20 minutes. The best time to go to the Post Office is when they first open in the morning. The shipping and receiving takes off for lunch between 1:00pm and 2:30pm. Sometimes you can still pick up packages though. The Post Office just hired a bilingual assistant. Before that there was not one employee that spoke English. We often over heard foreigners trying (bless their hearts) to explain something to the gal behind the counter in their broken up Spanish and it took some time to get it out communicably…Frank often intervened and assisted when we were in the PO. When Club Correos was still around (which is now Trans Express) we’d get all of our packages (They went through Miami Florida) with no problem! And now, well, it is a hit or miss, if we will receive our packages. We have ordered several things, not going through a club and we have not received several packages. What they will tell you is: If your package does NOT have a tracking number you will not receive it! You can go through Trans Express however, caveat emptor, it will be very expensive and some reviewers have said they have thieves in their office as they did not receive their packages. Some reviews are good though. We talked with the manager of the Cuenca Post Office a few months ago to let him know we did not receive several of our packages. To make a long story short, after some time with him explaining our situation . He said with a red face, “If there is no tracking number, you won’t get your packages”. He also told us regrettably and with discomfort that if your package is anything to do with electronics it will get stolen”. And so that’s that. Welcome to the Ecuador postal system. There are too many positive aspects about life here that we put up with this inconvenience, for now. We lost about $500 worth of goods and will never expect to see them. Most (9 out of 10) countries will not ship to Ecuador. Why? E-bay's rule is if it doesn’t arrive then customer gets reimbursed. So the E-Bay sellers just won’t ship here, since the stuff doesn’t arrive anyway. Makes sense, right? What about Letter Sized Parcels? Normally you can get letters, however it takes awhile. We’ve had letters from the U.S showing the date stamp of 3 months earlier. Three months after my birthday, I received a birthday card from my mom. What happened to these letters? First the letters and packages go to Quito and Guayaquil where they are stamped with the date and supposedly they just sit there until they are ready to mail them…and, they repackage them in a bigger envelope and then send them to Cuenca. Sending letters to the U.S takes a few weeks but receiving a letter from the U.S can take a few weeks and if arriving from other countries other than the u.s. then it could be months and sadly we have not received some letters. This is our experience and may not reflect yours. TIP: You must make sure you add AZUAY Cuenca Ecuador. Without the AZUAY, you’ll never receive it. Finally, we just went back to the post office last week to tell them about the loss of our packages, for the third time. One thing we have learned living in Ecuador, you have to have a lot of patience. Persistence in a nice way (not ugly American way) does work, sometimes. Anyway, they have another “new” manager at the post office. This is the third manager they have had in the last 6 months. 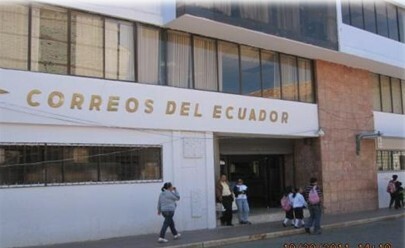 Workers come and go in the Ecuadorian banks, postal service, and other government offices like night and day. It makes it difficult to create business relationships with anyone because they move on, are transferred or get fired. Anyway, back to our story. So the new manager comes out of her office (we didn’t have to wait long this time) and we do our polite greeting and introductions and she proceeds to let us know that she already knows us and heard about our situation of not receiving our packages and btw one of our packages is an envelope sized parcel. She explained to us that they are working on getting our packages. She seems efficient and a go-getter, but only time will tell. We know we will never see the boxes; someone else is enjoying the fruits of our labor, but we think that somewhere in either Quito or Guayaquil is our missing letter. Our thoughts on this is all managers seem efficient because they talk a good talk and make things sound good, but then nothing changes and there’s another new manager…this is just what we have observed and experienced in the last five years. After awhile you see the pattern emerging and realize how it all works. There’s a lot of disorganization, theft problems and inefficiency of accountability in the postal service of Ecuador and that’s putting it rather nicely. In the last few months we have seen them try to improve the system inside the post office; hopefully this time it will get the kinks worked out of the organization. They are organizing the incoming packages in a categorized lettering system now and we were told once again by Jose, the English speaker that if your packages have a tracking number you will get it but if they don’t have a tracking number, you probably will not receive it. Other Shipping and Receiving Options? Shipping out is not the problem it is receiving where the problem is. So you can use Trans Express 4 by 4 systems that charge a hefty fee when receiving packages. You’ll spend three times the price of the product when using Trans Express. Is it worth it to you? Maybe it is. Yes, it may seem strange that a city of over half a million people would only have one post office but we think, until they get the one they have up and running smoothly, where everyone is receiving their mail and packages, pleeeese, pleeeese, pleeese don’t open another post office in Cuenca! If you liked this article, we think you might like these too. Hi Alex, yes we believe people should know everything, that way they can make a more informed decision based on "what it's really like to live abroad" instead of the roses and glitter. I am trying a new shipping service out of Miami called EconExpress. We'll see what happens. Hello Patty, thanks for sharing.